Join us on our Eat Pray Love journey! In anticipation of the movie Eat Pray Love, Tribute.ca’s special guest blogger, and author, Marissa Stapley, dishes on how the Eat Pray Love story has influenced her, and wants to know your personal thoughts and experiences. Happy travels! 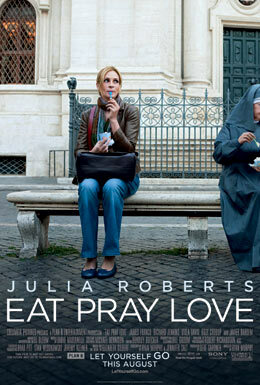 Eat Pray Love is the much-anticipated film chronicling the true – and epically best-selling-story of journalist Elizabeth Gilbert’s search for varying degrees of enlightenment in Italy, India and Indonesia. Julia Roberts plays Gilbert, a recently (and messily) divorced woman with a relationship track record that reads like a bad resume. Her decision to leap off the beaten track propels her into a journey that is monumental, life-changing and beautiful to read about. It’s also going to be beautiful to watch on the big screen! (And not just because Roberts is so gorgeous, and delicious Javier Bardem plays the romantic lead.) Gilbert’s tale has struck a chord around the world, holding strong on bestseller lists for more than three years and prompting a myriad of discussions about finding meaning in the world, navigating the highs and lows of love, and striking a balance within the connection between the body, mind and spirit. The movie that brings it all to life is worth talking about, too. Join us for the next two weeks as we get the conversation going in anticipation of the release of the majestic Eat Pray Love on August 13. Hollywood superstar Julia Roberts talks about travelling the world, being a mom and eating and drinking wine for her new film, Eat Pray Love. Julia Roberts dishes on her experiences making the film.